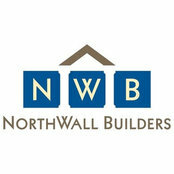 NorthWall Builders, Inc. (NWB) was founded in Palo Alto in 1996 by Mark Moragne and Stephen Reller. We specialize in new homes or major remodels in and around the mid-Peninsula, Northern California. 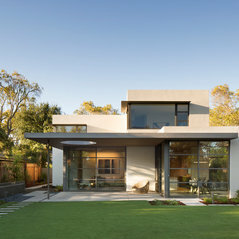 Our team brings to each project a deep appreciation for the art and science of fine homebuilding, a thorough understanding of the construction business, and an unwavering commitment to service. We invite you to contact us to learn more about NWB and our belief that our relationships with clients form the cornerstone to delivering excellent quality, on schedule and within budget. A commenté : Where is couch fromSorry the furnishings for these photos were staged by an outside firm, so we do not have that info! A commenté : Sliding doorsThe doors are made by Fleetwood. Thank you! A commenté : Can you tell me what material you used for the shake? 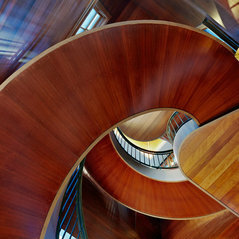 Wood or hardi?Hello, The architect for this renovation project was Aino Veira Da Rosa. Thank you! A commenté : Can you tell me what the stone is on the island?The island surface is Pietra Cardosa. A commenté : Basketweave and dot borderTile vendor was Walker Zanger. Main floor is Tribeca Classic White Basket Weave. Deco is Tribeca Flatiron Grey 3/8 x 3/8. Border is White Venatino. All grout is Hydorment, Silver Bullet.